Twisted Sketches Twisted Cards sketch challenge #83 and the "TWIST" is black. Got it covered! 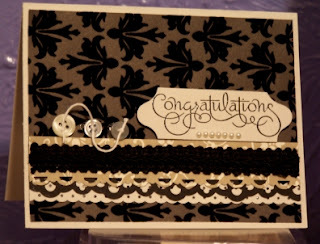 This card was created using Stampin' Up! Mocha Morning Specialty dsp. I love the "flocked" 2-tone black. I also used some Stampin' Up! 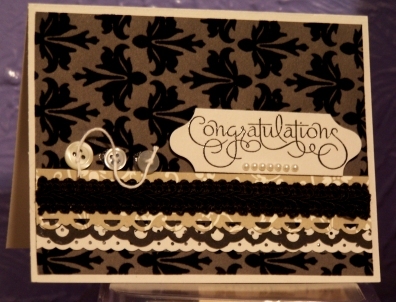 border punches: Dotted Scallop Ribbon, Scallop Trim Border, and Lace Ribbon Border. Be sure to check out this challenge at TSTC and leave some love for the DT members. This is GORGEOUS!!! I am soooo in love with the colors...the design...the stamps...everything! I'm not the person who make cards, I can't do it, I don't have any ideas to mix papers:( I preffer felt and soutache jewellery. Have you ever heard about soutache?